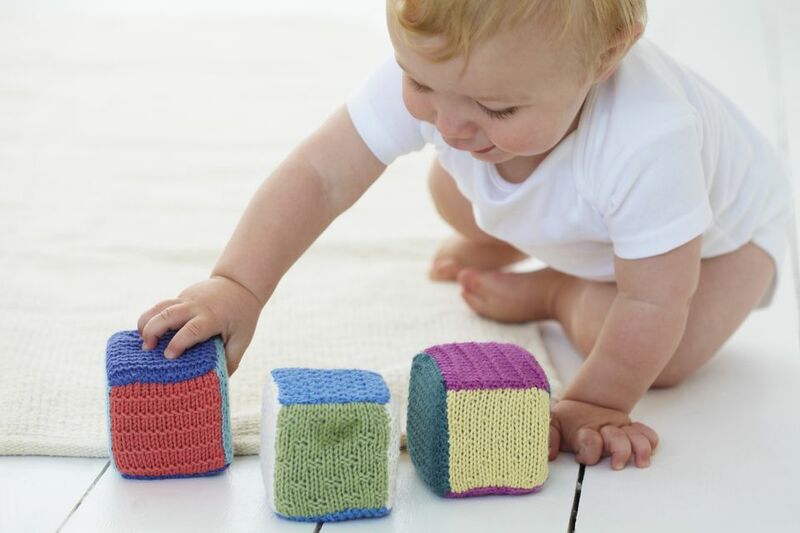 If you want to knit something for a new baby (or even a toddler) that will get more use than a cute little sweater the baby will quickly grow out of, consider a set of these easy to knit baby blocks. You can knit a bunch in different colors, use a different color on each side of the square, or even work them in Stockinette instead of Garter Stitch and decorate the sides with embroidery or duplicate stitch. This is a project that parents are sure to appreciate since these toys are a lot quieter when knocked over or thrown than wooden or plastic blocks. 18 stitches per 4 inches (4.5 stitches per inch) in Garter Stitch. Gauge is not critical, but you want a somewhat firm fabric. The finished block is 4 inches on all sides. Work in Garter Stitch 4 inches (for me, this took 18 ridges or 32 rows). Continue in Garter Stitch 4 more inches. Purl 1 row, on the same side of the work as before. Repeat the last two steps two more times for a total of four blocks separated by turning rows, all on the same side. On the side of one of the squares, pick up and knit 18 stitches along one edge. Work in Garter Stitch 4 inches, then bind off. At this point, you have what looks sort of like a funky T. With the side that has the flat side of the purl rows on it facing in, fold up the squares so that the long piece makes a box and the two extra squares fold in to make the top and bottom. Sew the seams together in this fashion, leaving a gap on one side for stuffing. Fill the block loosely and sew up the rest of the seam.